The compact tube cutter NEWECO POD-400 is used for pneumatic cutting (trimming) of the endings of polyethylene and laminated tubes after sealing. It is operated by one operator who inserts the tubes, presses the pedal and removes tubes after cutting. The operation is triggered with a pneumatic food pedal. 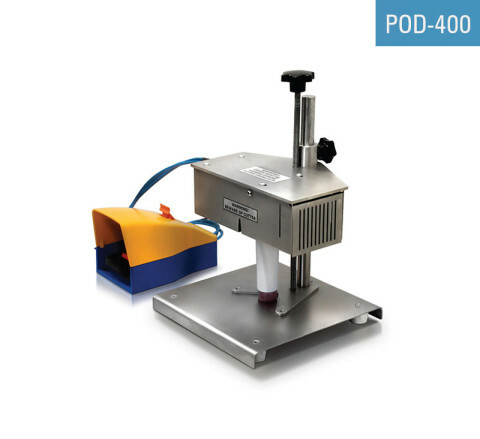 The compact pneumatic tube cutter POD-400 is used for small to medium size batches / production lots / jobs. This table-top tube cutting machine is widely used for regular production, producing samples or for testing purposes in laboratories / labs. NEWECO is a manufacturer of tube cutters for thermoplastic (polyethylene (PE), laminated and other plastic) tubes. Contact us to receive a price quotation. We do not trade with used machines / equipment, however we are convinced that you will find the pricing of our new machines very attractive. Our machines and devices are designed and manufactured entirely in Poland (in the European Union).